Good things come to those who wait… as the actress said to the bishop. But all this making us wait for the inevitable end is the sublime descending into the ridiculous – as the bishop replied. In the end, the man went… as he could or should have long before it became ridiculous to keep us waiting. It would have been sublime if his head had rolled as a matter of principle at the first whiff of something unsavoury, rather than have him offer it as a sop to the baying hounds in the House. There had been a veritable circus of questions, concerns, inquiries – and the corresponding responses ranging from the sublime to the ridiculous – about revelations made along the way at the commission to probe the infamous treasury bond scam which still demand answers. However while the ramifications of Ravi’s resignation are crystal to some, but clear as mud to many, there is still no resolution to the larger, broader issues; much less the likelihood of a far more meaningful result – the resignation or explanation of the men who appointed and defended him to the very end – any time soon. Therefore it behooves us to separate the men from the boys. Only don’t expect anything to change at the heart of the matter. Because one swallow does not make a summer, as the bishop told the altar boy. In pure and simple terms, a head has rolled while the rest of the rotten body totters and teeters on, while the mind controlling the mannequin continues smiling macabre-style à la the spectre at the feast. While nothing is pure and rarely if ever simple in politics, perhaps the expectations of the polity were just that – pure and simple – at the turns of events in January 2015… that there would be no hint of scandal in the House of Good Governance – much less that Caesar himself would be tainted with suspicion. And maybe it was natural to anticipate a sea-change into something rich and strange, given that government (being as ugly as it was then) could only become bad at best… or better still, good enough to begin to deserve the appellation ‘good governance’. Now it has become transparent within the relatively short space of time (after all, that is as much as two years is, on the historical scale of things) that this administration differed from the other in one aspect most demonstrably – that it had come to steal only, and not to kill and/or destroy (yes, ALL governments come to grow, develop, prosper; OR say they do). Such that there remained only one conclusion: that while political cultures may promise to change, human nature remains essentially the same… For the race is fallen. And in politics arguably it shows itself at its worst. Depend on it: the characteristic response of the innocent is to plead ignorance. Thus it comes as no surprise that no one in cabinet ranks had the foggiest that their finc min was a fink. Even if it is no defence at all – the law is broken by the most ignorant, and even such ignoramuses are subject to its long arm and awful majesty. But will anyone dare corral the elephant that still lumbers about the corridors of power? Will there be a presidential commission of inquiry into other ministers, even ones in their prime, who must share a part of the blame for harbouring in their own bosoms with hoops of steel the fox overlooking the hencoop? Definitely, the classic defence of the guilty is also to deny all knowledge. (“We had no idea he was corrupt until he resigned. Then only we knew.”) And thereby those still in power – and plum positions at that – may still hope to keep culpability at arm’s length. With the hope being that impunity from crimes commissioned and executed with full intention at the time will receive stricter punitive measures than the crime of omitting to notice what was going on under one’s eyes… on one’s watch; with or without one’s explicit blessing; perhaps with the most subtle nods and nudges; or (if one is not willing to be charitable any more) with one’s pat on the shoulders still stinging and one’s praises at being the fall guy still echoing in one’s ears. Especially ironic is that such criminals – both commissioners and executioners – will often prefer to appear nice and naïve rather than nasty and a nuisance to the national interest. Or be condemned for being incompetent and a repeated failure at remaining in power and winning elections, rather than corrupt by design or default. It still remains to be seen how far House as well as Cabinet will insist that all those with even a smidgeon or iota of responsibility for the ransack will go, or be asked to go, or at least be asked to give an account of themselves. Caesar’s protégés have proven to be fallen senatorial types, so Caesar himself can no longer remain above suspicion – of criminality, not incompetence, that usual suspect. CONVENTIONAL WISDOM: The man had to go. Even if nobody knew anything about it in the end as far as means goes. DEVIL’S ADVOCATE: There must be a movement (or many such men militating in favour of the machine that is the corrupt political culture of many a hue) behind such a man – and those men must go, too. Especially if the greater movement militating against many-hued corruption – good governance – is to continue with any credibility, in the country’s interest, in a time of dire need for transparency in state affairs; accountability at every level of government; and corresponding justice and fair play for the powerful and the anonymous who have held sway for too long to do our national reputation – and national welfare and well-being – any real or imagined good. Only do yourself and me a favour, dear and gentle reader, and remember that in politics nothing is ever pure and things are rarely if ever simple. Because coalition politics churns already muddy waters into a darker denser murkier compound, the range of defence mechanisms which it is possible to employ increases geometrically when parts of government are pitted against other parts in the reputation-management stakes. If previous governments culpable of cupidity were able and appeared only too willing to essay denial (or more violent responses such as “death to all critics and dissenters against our cabal”), administrations presently in bed with their erstwhile political enemies can present far more sophisticated arguments in favour of their exoneration from blame for the morass governance seems to be in. Such as when the leader of the party from which the culprit springs only recently sought to assure all and sundry that IF there are any corrupt ministers in the cabinet, he will summarily terminate their services. Which, of course, prompts the query who appointed them and retained them in office for so long in the first place. And in the face of a litany of previous charges, indictments, accusations, against the former finance minister courtesy a no-confidence motion which remained unheeded until the heat from a presidential commission was unbearable, it begs the questions whether Mr Cleanest Statesman in the Cabinet was a. at all serious about his declaration of intent to sweep the Augean stables; or b. bogged down a bit at defining corruption, because the practice of inveigling party supporters to bolster election campaigns and contribute to national development drives necessarily meant that ministers were permitted or encouraged to retain their cut – a petty percentage to be sure. IF one is comparing the present lot with the past regime, this may be acceptable, one still thinks! BUT we’re not comparing apples with oranges any longer, are we? AND it is a lamentable fact that while corruption under crooked and murderous regimes of yore is cutthroat and exclusive, the ‘campaign contribution’ and ‘development drive’ culture under purported sea-green incorruptibles is no less sordid. It’s (another regrettable reality that the major government party’s defenders have invited yours truly to consider) just senior politicians who know the score and inherited the GOP’s MO from the Old Fox being inclusive and fair-minded and ensuring a fair share for the boys in blue (er, green). Regarding suppressing the full extent of how far the rot went, both parties of either colour were equally facile. 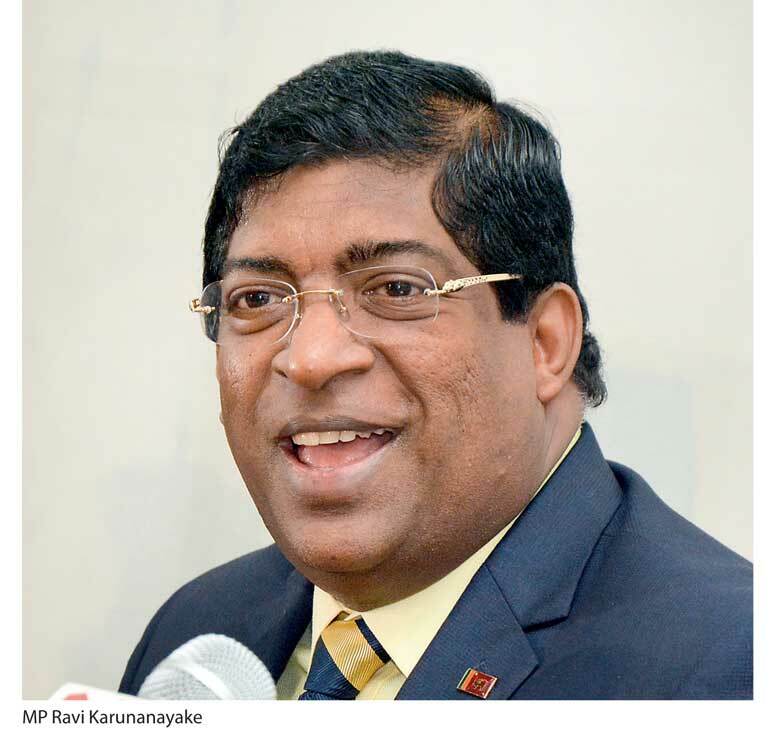 The raucous shouting of the UNP that it was an opposition conspiracy and the ridiculous silence on the part of that split SLFP which is ironically lumped together with the so-called ‘joint opposition’ best encapsulate this defence. That if we shout loud enough – or remain silent long enough – then the issue will go away… Which is only another defence mechanism whereby the real truth is suppressed – that the corrupt are not limited to one party, a singular or solitary perspective, or any particular political philosophy. But that the whole cauldron of our present political culture is tainted with a patina of cupidity. And that the whole kit and caboodle of government and opposition – which are virtually interchangeable as regards their worldviews on wealth, treasure, possessions (oh, never mind the dialectic of economic values or principles) – are more alike on inside than the outside. Where the idols of Mammon squat on their secret thrones, no matter what posture they adopt for public consumption. As can best be seen, maybe, by the fact that no one is protesting anything anymore now that the scapegoat has been shooed off into the political wilderness. It is atonement without actual remorse, or any resolution to right the raft of wrongs – plans, policy, procedure, programmatic corruption at the uppermost echelons of the business of politics – that permitted the scam in the first place. Ridiculous, right? If only the powers that be had persecuted the past offenders with even half as much a vengeance, not many would quibble if the comparisons persisted – For while the joint opposition rattle sabre convincingly against their partisan president, and the prime minister’s party still does nothing persuasive but let the law take it due and delayed process to bring the corrupt senior bureaucrats of the previous administration to book (and/or the dock), suspicions will persist that the lack of due progress against ‘Rajapaksa & Co. ’ smacks of political expediency. It is rumoured that the Family of Former Capos serves as a bulwark against the capo di capo tutti of the incumbent Paddy Mafia and its presidential figurehead in the inevitable event that the honeymooners in a political marriage fraying at the edges goes down to the wire, as it must do sooner than later. The thrusting of one’s guilt, shame, fear… on scapegoats and sacrificial lambs to the slaughter. That sneaking suspicion at how and why the investigating authorities have been able and willing to prosecute their duty so competently and swiftly to produce results. Whereas they have seemingly fallen flat on their faces in outstanding cases of egregious crime and corruption leftover from the crooked clans and covens of the previous powers. Thereby fuelling speculation that the finance minister (despite paying the price of transparency and accountability – but significantly denying his culpability all the way to the dock, and steadfastly refusing to resign up to yesterday) knows that he has become a pawn in a scurrilous endgame. Sorry to be so subversive, especially after the government has scored an own goal… but present projections that all must be well now that one corrupt politico has been brought to book beggars belief! Are we SO naïve? E.g. 1: When the bond scam first surfaced, a deputy minister reputed for his probity lost his cool at unrelenting questions as to the impartiality of the three-man party-lawyer probe mechanism appointed by his government to inquire into the dubious T-bond deal which lost the nation’s coffers billions of rupees and deprived the elderly and retired their dividends via EPF/ETF investment in it – Was that emotional outburst a sign that deep down, deputy ministers loyal to their premiers come hell or high water still desire the heaven of transparency and accountability? The bottom line is that if we trusted government little two years and a tad more, we trust it a lot less today – even if, as, and when it is doing its best… or, at least, some good. Perhaps ‘good governance’, ironically, is more to blame for the erosion of public confidence in our elected representatives than the previous regime and their self-appointed rapists of the state treasury and national asset storehouse in the same breath. Really good things never come to those who wait. Therefore, in a political climate where the new pseudo culture has been stripped of its mask and the veneer of greed and crooked governance by power-hungry mandarins trapped by their own ambitions enough to turn a blind eye on the doings of their peers and protégés, little hope remains that anyone will come clean out of the goodness of their hearts. Perhaps now, more than ever, it is incumbent on civil society – with all its warts, too – to reinvest in our trust and faith not in men and machines, but in the movements that still have the potential to transform the pockmarked pallor of the present state of our socio-political fallenness. Remember that it was a venerable monk walking the streets – and not some venial Machiavelli waiting in the wings for a crown – who dreamed that our country might one day be not only free, but also pure… and resolve to rid ourselves of our ridiculous faith and trust in horses and chariots. The four horsemen of our apocalypse have been… Faith – in politicians and their mercurial platforms, rather than valuable principles; Admiration – for wilful movements that carry all before them, rather than be humble and bow before the people’s wishes; Character – that weakness of the polity for erecting monuments to war heroes, powerful bureaucrats, and conquering generals, in their very lifetimes; Stability – a penchant to bow to the expedient of peace rather than be bruised a bit in the process of social change. Perhaps these four – the FACT of our socio-political makeup – have always ridden alongside the Caravan Of Nothingness that has escorted our pilgrim people from fire and brimstone of the Old Political Culture of growth, development, progress – at a price, and also at the pleasure of power – to the tabernacled camp of the New Political Culture with its false promises of a wife in every port and silken girls bringing sherbet in the temple of personal health, wealth, and prosperity. Rest assured that even now that our waiting for Mr Clean to do good or Good Governance to come clean have resulted in a resignation (rather than a brutal rebuttal, a politic transfer again from finance to foreign to fiddlesticks, and a return to the business of politics as usual), there is still the legion of nameless faceless folks who have still managed to escape the chariots of fire and the sword of justice which may well be thought to include kings, commoners, statesman, senior mandarins, et al. If you’re rejoicing at the apparent climax – that the head-rolling means the movement has come to a head – come again, as the bishop said to the actress. There are miles to go before we sleep, and many more promises to keep. One corrupt – or seemingly complicit – head rolling is a good start, but let’s not get carried away calling it a major breakthrough despite the hype and hoopla of the hyenas in the hole in the ground grandly calling itself a joint anything. When those guilty of grand larceny or its equivalent in governments gone by are brought to book and put under lock and key for crimes worse (if I may be permitted a comparison) than cupidity, then I’ll come… join you – to celebrate a new, clean, pure, political culture. Until then, this is the bitter pill – one swallow – that makes not summer, but the bleak midwinter of our discontent all that much more bitter. Because it smacks of managed spectacle for the benefit of the truly, powerfully, corrupt – who still remain at large, anonymous, or smiling all the way to the bank… still.